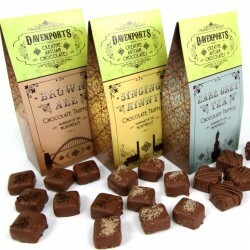 Founder of Davenport’s Chocolate, Jane Williams (née Davenport) has worked as a professional chocolatier since September 2000. Master chocolatier Philippe Burger’s protégée, she has travelled extensively throughout Europe gleaning much from a wider European dedication to chocolate. With the help of husband Michael they launched Davenport’s Chocolates in September 2007, refurbishing a factory unit to become a high spec chocolate studio. 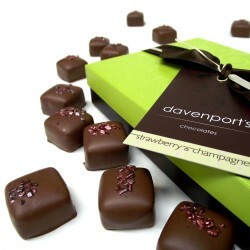 Jane has since trained Jenny to become a chocolatier, and the two of them are the core chocolate makers at Davenport’s Chocolates. 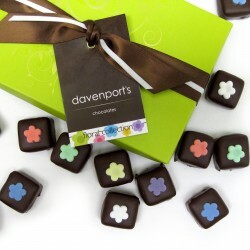 They love to create all Davenport's artisanal chocolates, experimenting and developing new ideas to revive a lot of nostalgic, vintage chocolates with innovative and contemporary techniques. With their passion for chocolate as the driving force, their lovely gift boxes of handcrafted chocolates are enjoyed by many a discerning chocolate lover, up and down the UK. NB Please note, that although we are able to list some products as being 'free from' certain ingredients, we do use some allergen ingredients onsite. We would therefore not advise purchases to be made of our products where ingredients should be avoided due to allergies, only where this is due to lifestyle choices. Thank you!